This article was posted on 12th April 2016. Tell us a bit about yourself, your blog and your personal style. Hey! I'm 30, live in South Croydon with my husband Jason and daughter Marley, who is 3. I'm a blogger and interior stylist. People say I'm a bit of a maverick. If something is on trend or lots of people like it then I'm bound to like or do the opposite! I'm big on statement style and expressing your personality through design - be that fashion, interiors or food even! I started my blog about 2 years ago as I'd just bought my first home and had started doing it up. I really got into the process and started to think that perhaps I could pursue the whole 'interiors thing' as a career. 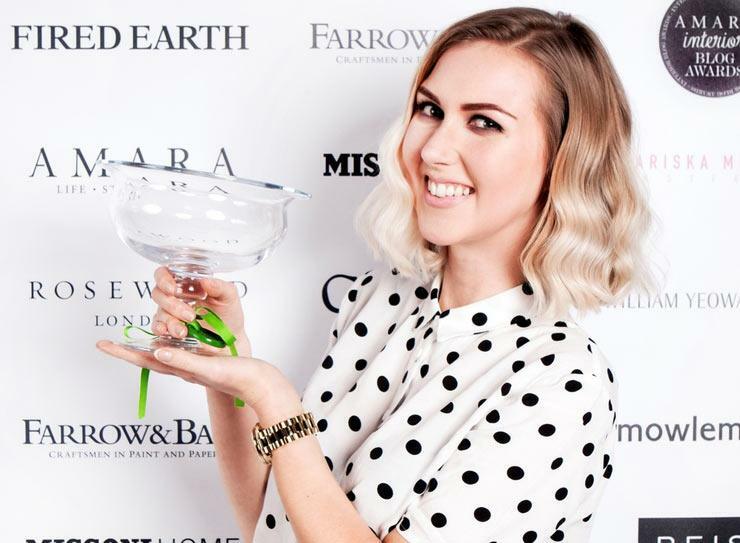 My blog focuses on my journey from working in an office to my dream career in interior styling and design blogging. It's warts and all, straight talking and honest. What makes the perfect bedroom in your opinion? I'm obsessed with a good a deep pile carpet. I shoot in a lot of beautiful location houses with my job and the one thing they all have that I envy is that deep, cosy carpet. A great duvet, pillows and mattress to sink into at night really make your bedroom special too. I recently upgraded mine and it's made the world of difference to my sleep. Of course, a bedroom should also be sensual and enveloping in my opinion. I love dark colours and luxury brass fittings as they feel quite glam and intimate. Well, if you'd be expecting me to say 'a perfume bottle, a stack of antique books and a chic ornament' you'd be completely wrong... ha! I usually have about 5 glasses of water, lip balm, a lamp, my glasses, watch and whatever I'm reading at the moment. It seems always to end up there but I never actually read in bed! When you travel, what do you miss about your bedroom? My daughter and husband! I do love staying in hotels though, it feels like a little bit of luxury away from home. I love spreading out and star- fishing·across the bed. 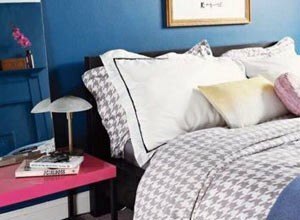 What 3 French Bedroom Company items would be top of your bedroom wishlist? 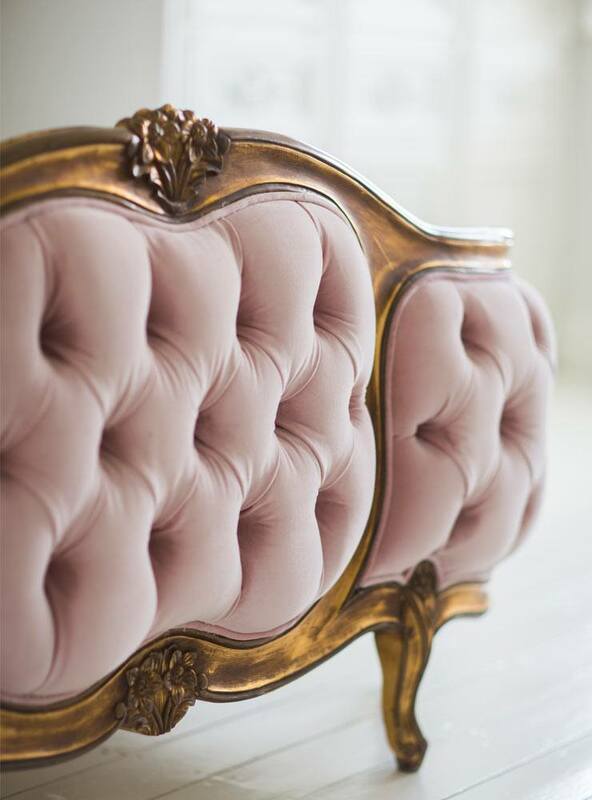 I'm obsessed with the Sacre Coeur Pink Velvet Bed, it's so dreamy and opulent! I also love the cowhide storage trunk because it's a uber glam and the free standing Glorious gilt mirror which I actually used in a client's bedroom recently. Lastly, what do you have planned for 2016/what can we expect from brand Sarah Akwisombe? I'm expanding out my 'No Bull Blog School' and taking on another intake of students in June which will be loads of fun! I'm also working on a few styling projects and spending my time discovering new design inspiration to write about on the blog.